The south coast of Brittany from Loctudy to Quiberon. Scale: 1 : 78.500. One-minute gridlines. Larger scale plans of Lorient, Lorient yacht harbour, Port Tudy, Etel, Port Manech (Aven river), Brigneau and Merrien, Loc Maria, Lomener, Doelan, Le Poldu, Port la Foret, Concarneau, Port Maria. Tidal stream diagrams. 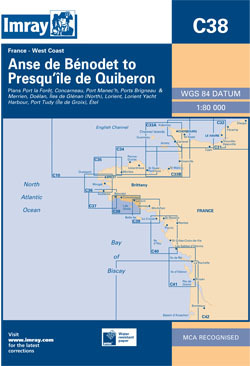 2010 edition updated to include buoyage in the approaches to Concarneau revised and enlarged marina at Port la Forêt now displayed.